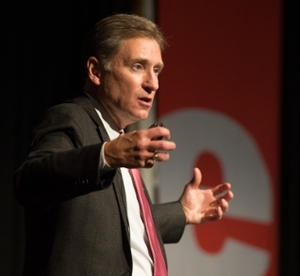 Southern Illinois University President Randy Dunn addressed the state of the system today in the Morris University Center’s Meridian Ballroom on the Edwardsville campus. Dunn said Illinois seems to be in the midst of a grand reshaping of the state-university covenant, but he believes all campuses in the SIU system will remain viable for years to come. He pointed to instituting structural changes on campus rather than waiting to change, because a “new normal” is likely. He emphasized that SIU leaders need to address how the University can effectively deliver upon its mission in light of state budget decisions, and that it is good for the University to review internally. Future success will require strong and stable leadership at the campus level, and the fortitude for all campuses to manage reasonable risk. Dunn said institutional distinctiveness will be an asset, particularly as students have more options and are considering how an institution meets personal educational needs. Retention and graduation rates will become more important in conversations with the community, legislators and potential students, particularly if the trend will be toward performance-based funding. Additionally, universities need to underscore public service for both the good of the community and as an educational foundation for students. “We have no more clarity today than we did a year ago on how this gamesmanship is going to play out,” said Dunn, in regard to the state budget crisis. His stated purpose was not to prescribe plans to the individual campuses, but provide a broader vision for SIU’s future. “We’ve always been able to navigate our way, to figure out our way to the next day, the next year,” said Dunn, as he advocated for administrative systems that facilitate nimbleness rather than slowing innovative processes. Dunn expects there will be a different approach with the state’s level of funding for higher education. That assumption is based on his experience with on-going policy discussions about the future of Illinois higher education, as well as changes to the relationship with the state that have already occurred because of the budget impasse. Dunn discussed possibilities might include the consolidation of certain duplicative degree programs offered at state institutions, and a possible shift to performance-based funding for universities. Dunn explained his call for innovation should not be viewed as a sign of retreat. Photo: SIU President Randy Dunn during his State of the System address at SIUE’s Meridian Ballroom.